(CNN) - Democratic Senate hopeful Elizabeth Warren raised more than $8.6 million in the last three months, her campaign announced Monday. The second quarter figure surpassed her first quarter amount of $6.9 million. She now has $13.5 million cash on hand, according to the campaign. Warren is locked in a bitter race against incumbent Republican Sen. Scott Brown, who's fighting to keep the seat he won in a 2010 special election to replace the late Ted Kennedy. Warren, who served as an adviser in the formation of the Consumer Financial Protection Bureau, has strong backing from national Democrats, including President Barack Obama. The president praised the candidate at a recent event in Boston. Her campaign said they "experienced a surge in grassroots donations" last quarter, with 81% of donations amounting to $50 or less and more than half at $25 or less. 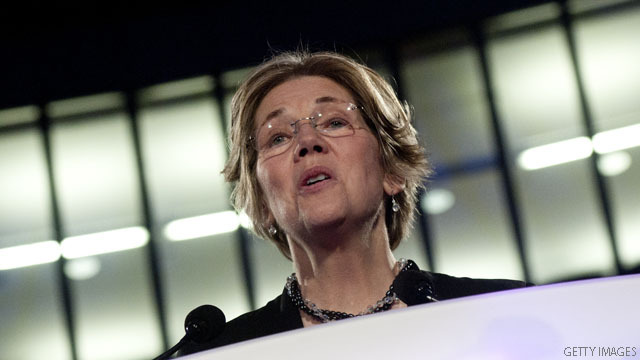 "Elizabeth Warren has fought hard to create a level playing field for middle class families. It is those men and women who are fueling this campaign," said Mindy Myers, Warren's campaign manager. While money seemed to pour in last quarter, Warren faced some of her toughest scrutiny during the same window of time, taking heat over allegations that she claimed Native American ancestry as a method for career advancement. Clarifying, Warren, a Harvard law professor, confirmed she told employers at Harvard and University of Pennsylvania of her heritage, but noted she did so only after she was hired. The story, however, remained in the headlines for weeks, as Brown's campaign continued to call for her to answer questions about the issue. The Warren campaign also said June marked the best fund-raising month overall, with $3.1 million raised. Brown's team argued Warren's war chest largely depends on "out-of-state" donors and "extreme special interests." "Ultimately, however, elections are decided by the voters based on competing visions for our future, and Scott Brown will have the resources he needs to share his pro-jobs message and independent record with voters across the Commonwealth," said Brown spokeswoman Alleigh Marre. "No amount of money can wash away Professor Warren's support of job-crushing tax hikes that would devastate our economy, especially in the wake of Friday's incredibly weak employment report." While Brown's campaign is not yet releasing its numbers, the incumbent brought in $3.4 million during the first three months of this year and had $15 million in the bank at the end of March. Go Elizabeth! Bring fairness back! Can't wait for the books.....Scott Brown: From Senate to Sears Catalogue (a poser wherever he goes). Or maybe Mr. Poser Goes to Washington? In addition to claiming her status as a Native American minority, she's now claiming being a female is now a minority class, so she should be given the seat in congress because of her double minority status. How much of that was those donations from more "generous" people? How much came from Native American casinos? An rich litest leftist Haaaarvard professor or a down to earth guy who has served our country in the military? HA! Easy choice there!! The US Senate doesn't need anymore more far left loons like Warren. They already have far too many of them. Doesn't matter. Koch just wrote another check for 18 million to Brown. Elizabeth Warren is unfair to millionaires! Go Elizabeth... We need you in Washington!!! I'm very dubious about Warren. She will push for laws that prevent banks from taking dangerous financial risks, so they might stop causing economic crashes and needing bailouts... sounds socialist to me! "I'm very dubious about Warren. She will push for laws that prevent banks from taking dangerous financial risks, so they might stop causing economic crashes and needing bailouts... sounds socialist to me!" Yeah, I mean, c'mon...what better way to make the middle-class happy with half a century of stagnant salaries and shrinking family wealth than by throwing the occasional recession just to remind them that they should be thankful for the little that's allowed to "trickle down" because the only time it's better to almost have something than actually have it is when that something is nothing? I guess all the money isn't on Wall Street, some of it is on Main Street! Sounds like some of the 1% have defected to Democrat. I guess all the money isn't on "Wall Street", some of it is indeed on "Main Street". Common sense rules and regulation for the Bankers and everybody else.. Works for me! You should be dubious about Warren. A Harvard professor that has never run a bank should be telling them how to run a bank. There is risk in everything. If you want no risk, then do nothing. How would that have worked out for all of us if the Wright Brothers had done that? Or Steve Jobs? Life is nothing but a series of risks. Get over it. Boy those corrupt union bosses can sure throw their money around when they want to can't they. Don't worry, Elizabeth will give it to SEIU/ACORN to steal the election for her and the most incompetent, inept, corrupt, union toady president in history. Lying Dog Warren need much wampam to fix forked tongue problem. Scott Brown is an independent voice. He looks at all sides of an Issue, and uses a common sense approach. does not recognize our need to reduce the debt. Tell that to that Tea Party congressman, [Kirk? that guy who owes thousands in child support] out in Illinois who is running against a female vet who lost her legs in combat. He's been blasting her because she's a vet. He says she talks about her combat experience too much. Hey, that is her strength. You should be dubious about Warren. A Harvard professor that has never run a bank should be telling them how to run a bank. A guy who's never gotten an "A" in college should not be telling people how to run banks....and he definitely should not be making decisions about student loans.